We've been eating lentils quite a bit lately. While they have been a staple for some families for generations, I admit I did not know what to do with them aside from adding a handful into soup or tossing them into a stir fry. 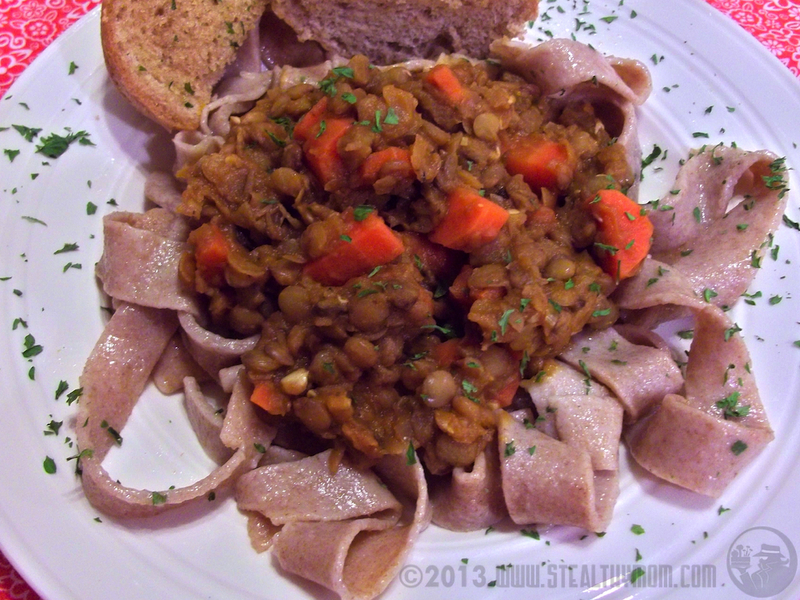 Lentils are quite versatile and have a meatiness to them. Full of protein and fiber, high in iron and folate, lentils are really cheap, too. Cooking dry lentils with a sauce gives them a rich flavour. Lentils with Chunky Marinara Sauce brings lentils to one of the kids' favourite pasta dishes. Tangy tomato sauce, chunky vegetables, garlic, basil and oregano.... We served ours over homemade whole wheat fettuccine but rice or gluten free pasta would have been great, too.